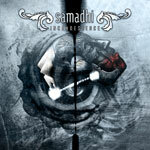 Samadhi hails from Maryland bringing a sometimes unusual mixture of metal music. According to their own self-definition, they combine 'the speed and aggression of modern thrash with the finesse of melodic Euro-metal' (whatever that is). The former elements are immediately distinguishable throughout with one listen. As for the latter, depending upon how the define both finesse and Euro-metal, this may be more difficult to identify. Essentially, what you have on Incandescence is both deriviative and slightly novel American metalcore. It's deriviative because they do nothing different than their peers: thrashy, heavy riffs and little lead guitar work, death/dirty vocal screaming mixed with some obligatory clean vocals: same sh*t, different band. The dirty vocals are, as usual, so monotonous and predictable to become annoying after only two songs. This thread is found from beginning to end, but is mostly present from 'Ashes Of Yesterday' to the closer 'Catastrophe.' Generally, except for brief moments escaping metalcore and some zippy, but brief, fret work on several songs, you can ignore 60% of this album. What's a bit more novel is the inclusion of some interesting and quirky synth work, some recognizable melody throughout, and some rather impressive, yet short, guitar solos. (This may be where their allusions to Euro-metal come in when they pursue more melodic heavy metal.) This motif comes at the beginning of the work beginning with 'Sea Of Agony' and ending with the title track. Of these, stick with 'Sea Of Agony,' Forever Never Lasts' and the quite impressive 'Abandon All Hope' for Samadhi's best and most creative work. Samadhi is on the right road on 'Incandescence' when they leave the slough of metalcore monotony and pursue melodic heavy metal with clean vocals, true heavy metal fret work, and solid melodic song arrangements. Otherwise, Samadhi is just another run-of-the-mill American metalcore band with a few tricks up their sleeves. Samadhi is on the right road on Incandescence when they leave the slough of metalcore monotony and pursue melodic heavy metal with clean vocals, true heavy metal fret work, and solid melodic song arrangements. Otherwise, Samadhi is just another run-of-the-mill American metalcore band with a few tricks up their sleeves.